The twelfth release from Vienna duo Novy Svet is a sentimental collection that spans 12 years and 12 songs. Recorded in their hometown, Vienna, Barcelona, and Hamburg from 1998 to 2010, the retrospective draws from across the band’s catalog, showcasing their defiance of genre boundaries. 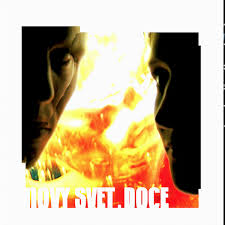 Creating a fluid mixture of folk and experimental sounds steeped in the haunting tones of “neo-surrealist” instrumentation, Novy Svet’s DOCE is an avant garde masterpiece and an ideal entry point into an endlessly varied, apocalyptic folk scene that captivated European audiences in the late nineties, before heading the U.S. a decade later. Ghettoblaster recently caught up with Novy Svet Juergen Weber to discuss the record, which hit the streets via Kill Shaman on January 21. This is what he said about it. When did you begin writing the material for the album? DOCE is a compilation of tracks written/recorded over 12 years of time. Most of the songs have been available on our regular CD-albums (which are most out of print), but some of them see the light of day for the first time. I think the oldest track to be found on the LP is ’ninos de la bola’, which was written and first recorded late ’98 or early ’99. ‘yo no‘ is the youngest of all presented tracks. It was done for an album that never happened as the group fell into a deep coma. Well, Novy Svet never was a ‘band‘. Nearly all tracks in our discography have been written, recorded and mixed in one go (nearly live)…and each and every time we applied different methods. We recorded songs on two tape-recorders ‚ ping ponging between them…on old sampling keyboards….with 100 percent acoustic instrumentation….one album was recorded on one synth only…etc…etc….I had, and still have, the tendency to get bored easily, so we reinvented ourselves every day. There was no problem with any of the songs that can be found on DOCE. They just appeared in this world – in exactly the same form they can now be found on the vinyl. There never was anything like a concept during our recording process. at least not until we pressed the record-button. Novy Svet was my very own group and the involvement of frl. tost, my girlfriend, came naturally. I do thank all the people who once were part of the line-up on the record’s cover. On DOCE you can hear appearances of Flavio Rivabella (‘Der berühmte post-industrielle Trompeter’, ‘Mushroom’s Patience’, ‘The Sentinels’,…) playing trumpet, Rafaele Cerroni (‘Mushroom’s Patience’) and Demian Recio (‘O Paradis’) on bass, His Divine Grace and Wermut doing electronics. Did anyone produce the album? Who engineered and mixed it? What input did those people have that changed the face of the record? No, Novy Svet records are not ‘produced‘, just recorded…with a dictaphone if nothing else is at hand. Is there an overarching concept behind the album that ties the record together? No, I would not say so as it is a kind of ‘introduction to the group‘. But for sure Novy Svet always circles around the same topics….anyway, I think the songs work together quite well and do represent many aspects of the group. ‘espina,’ ‘niños de la bola’ (which appear as a live-version recorded at our second concert taking place at the first HauRuck!-festival), ‘amore…’, ‘titan’, ‘desgracia’, ‘fin…’ and ‘opio’ often were part of our live-set. Of the ones I have named ‘amore, amour, amor’ always got strong reactions. Usually this was played as the last song. I would say emotionally the most striking always was ‘fin.finito.infinto’. More than one time I have seen people in the audience crying….and sometimes I was crying with them.